Protect your firearm to the max when it is in transit or not in use by selecting Plano's 1535 Pro-Max PillarLock Take-Down Gun Case. Plano uses thick walls fortified with their signature PillarLock system to create a framework that resists and protects against crushing forces. The Pro-Max features a molded-in carry handle that allows you to carry the case in comfort. Model 1535 also includes tough lockable latches to keep your weapon safe and secure. 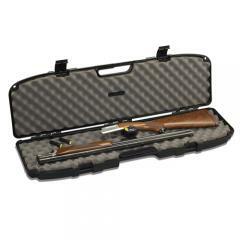 This black gun case by Plano is specifically intended for take down firearms and is airline approved for travel. Dimensions: 36" x 10.75" x 4"